Thank you for booking your newborn photo shoot with me! This guide should give you all the information you need to prepare for the photo shoot, what happens during and after the session - and should hopefully answer any questions you may have, but do feel free to contact me if there is anything you're not sure of! Please contact me within 48 hours after your baby is born, as I shoot newborn sessions ideally between days 5-12 after birth. 95 The Ridgeway, Marlow, Bucks SL7 3LH. I always encourage parent and baby photos - even though you may be feeling so tired - I would say around 98-99% of my clients choose these images in their gallery as they really are precious. Please think about the colour palette of your home before you decide on your clothes. I do recommend neutral shades and with little or no pattern, but feel free to contact me to discuss this further - a simple black t-shirt top can look effective, along with brown or burgundy - please feel free to discuss this with me and I can arrange suitable set ups if required. Most babies are born with, or quickly develop scratches, dry skin and marks on their delicate skin. Don’t worry, this is all dealt with in the editing room. I have a variety of props/backgrounds to use and try to keep the colours neutral and natural, in order that they will always match your home colour scheme and to keep the focus on the baby, not the props. If you would like to bring along a blanket or teddy that is particularly important to you then I will try to incorporate this in some of the shots at the end of the photo shoot. Upon arrival and before the shoot starts you will be asked to complete a Child Image Release Form and agree to the T&C’s (which can be found on the website), which gives your permission for me to photograph your child(ren) and provides me with your details (address, email etc). Please ensure you have read through the Terms and Conditions prior to attending your photo shoot. The session fee of £99 pays for the session (usually 2-3 hours), use of props and a password protected fully edited gallery to view. The session fee is payable at the time of booking in order to secure your time slot. You then have the option to choose between three different packages, details of which are on the website. If you are also bringing along your babies sibling(s), I will need to be informed before you arrive for the photo shoot. These shots are taken in the first segment of your session and usually take around 20 minutes. My advice is to bring along an extra adult to take them away after their pictures are taken and care for them until the end of the photo shoot. In order to protect babies and any siblings I do not provide any hot beverages, however, I do provide water in abundance as the room does get very hot (the room needs to be around 26-28 degrees)! Please feel free to bring along your own drinks and snacks if you would prefer. Please allow between 1.5-3 hours for your newborn session. Babies can be very unpredictable and I like to allow plenty of time to create those precious memories of your new bundle of joy. Your baby will be very new and tiny and if at any point you just need a cuddle with your new bundle then please do just ask! ~ If possible, bring baby only in a baby grow with no vest underneath, this makes it easier for us to start to session straight away if your baby is asleep on arrival to the studio. ~No socks to be put on the baby please, to avoid marks on your babies legs. ~ If possible try to feed your baby before arrival to the photo shoot (approximately 30 minutes), bring along plenty of spare milk if applicable, and we are of course breastfeeding friendly. ~ Spare tops for parent(s), as baby will be in skin for most of the session, we wouldn’t want you to get caught out, as accidents DO happen! ~ The room will be between 26-28 degrees so you should wear layers so as not to feel too warm. ~ For nursing mum’s avoid eating spicy foods the night before the shoot so that your baby doesn’t have a tummy ache on the day. ~ Keep baby awake 1-2 hours before the shoot if at all possible to ensure a very sleepy baby at the right time – talk and play with your baby, maybe give the baby a bath, anything to keep them alert! ~ If you have a dummy/pacifier then DO have this to hand during the shoot, even if baby hasn’t used one before they are really handy to even, even if it’s just for the session. ~ The timing of the shoot depends entirely on the baby, and not how long I have available, so it may be a bit of a wait while the right pictures are captured – so come prepared! Around 1-2 weeks after the photo shoot I will be in contact to send your gallery over to you in a password protected online gallery. You can then make your order whereby payment is required upfront. Orders can take up to 7-14 days to arrive ready for collection. 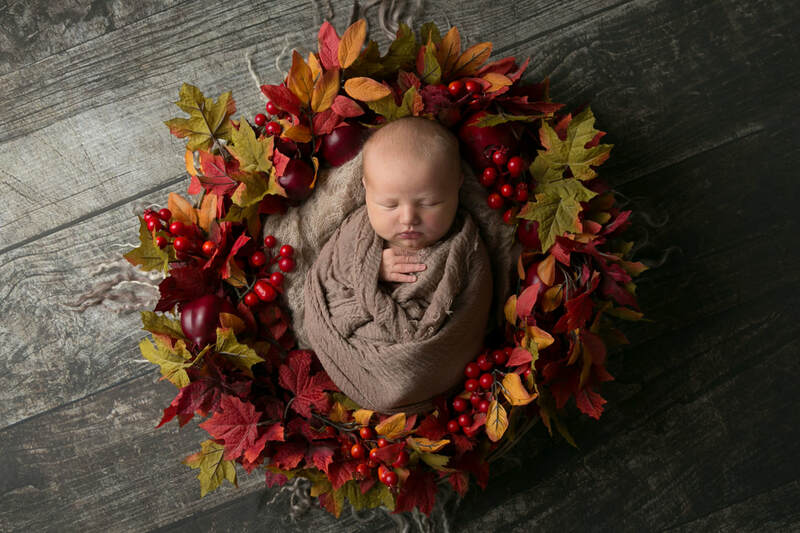 I love to see babies in the months following their newborn shoot and it is great to capture these early months of their development, from sitting through to standing. Please contact me if you are interested in booking further sessions and take a look at the website for more information! If you need to contacted me for any reason, my mobile number is 07752 363 052.